Negotiations break down. Countries prefer to emphasize their national interests. The USA abandon their climate policy objectives blocked in Congress. Canada, Australia and Japan eventually join the USA position. 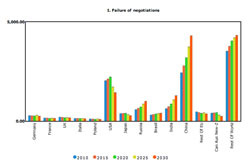 Only EU meets its commitments of -20% in 2020. However, in 2020, proven global warming revives the negotiations. The USA, Japan, Canada and Australia decide to reach -20% in 2030 (relative to 2005). The rest of the World does not commit. As regards the European carbon market (valid in GEMINI-E3 only), it is assumed that, within the EU, a market of emission permits is introduced at national level to arrive at a single CO2 price for non-ETS sectors. Two CO2 prices coexist for an ETS sector and another for non-ETS sectors. The price of the ETS would be equal to 32 € in 2020 and 73 € for the non-ETS. 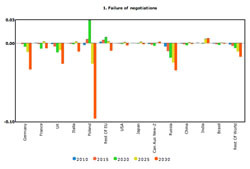 Starting from 2021 the adoption by the other industrialized countries of GHG emissions abatement policy and the establishment within those countries of a market of emission permits reduces the international price to 28 € in 2025 which then rises to 83 € in 2030. 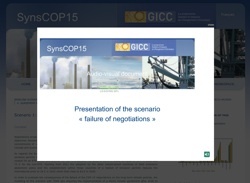 In order to evaluate the consequences of the failure of the COP-15 negociations on the long-term climate policies, the modeling of this scenario with TIAM also assumes the implementation of a World climate agreement after 2030 to satisfy a long-term climate constraint corresponding to a maximal long-term temperature increase of 2 degrees C.
Please note that results below from GENIE are relative to 2005. 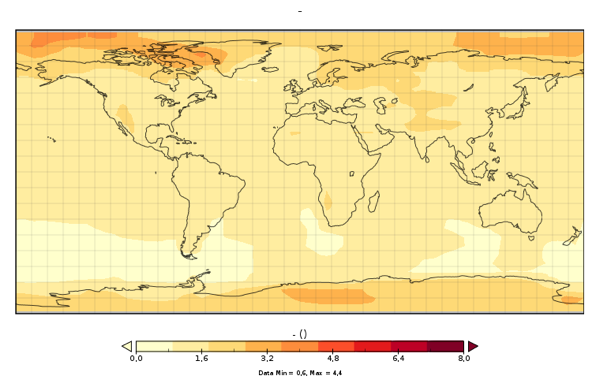 In average, the temperature change relative to pre-industrial is 0.76 degrees higher. Click on each of the following links to see the corresponding figure. More detailed results in the Energy - Technology technical note. In this scenario the negotiations fail. However after 2030 one assumes that cooperative measures are implemented to reach the goal of maintaining SAT change in 2100 under the 2°C limit. in percentage of household consumption. This policy has a macro-economic impact in terms of variations of the surplus, expressed here as a proportion of household consumption. 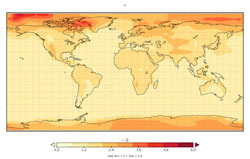 (surface air temperature) average change in °C in 2105 compared to 2005. 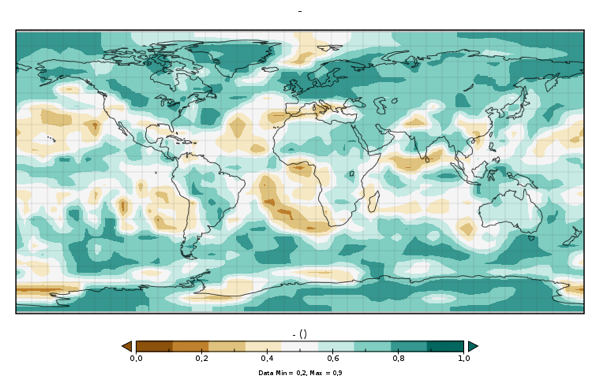 Due to the assumption that, after 2030 a full cooperation occurs to reach the climate target, the concentration paths yield a long term temperature change which still looks acceptable. However, the overall cost is greater.